There was one out to go, but the game was still on the line. Who wanted it? Who preferred that someone else take care of it? 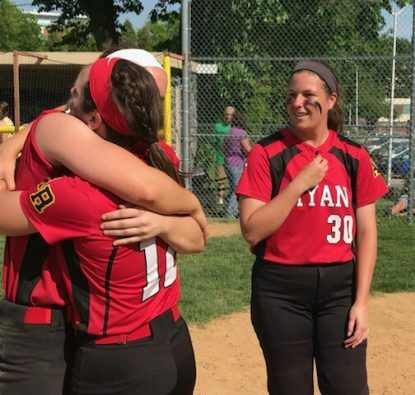 Asked later, no player claimed she didn’t prefer the honor of recording the final out of Archbishop Ryan’s 1-0 Catholic League softball victory over Lansdale Catholic May 25 at La Salle University. That included sophomore first baseman Sarah Vargas, who snared a line drive off the bat of sophomore Casey Meenan to clinch the Ragdolls’ fourth title in five seasons. “Dana” is freshman pitcher Dana Bell, who tossed a three-hit, two-walk, 11-strikeout beauty. In three playoff games against eight-seed Cardinal O’Hara (2-1), four-seed Archbishop Wood (3-0), and three-seed Lansdale Catholic (1-0), the likeable frosh was perfect minus six singles, three walks, and zero earned runs while striking out 26. Her overall performance will be statistically remembered as among the all-time bests. Bell’s defense appreciates her steadfast control. Ryan sophomore first baseman Sarah Vargas squeezed a line drive for the final out in the championship game. Asked to explain a playoff experience for the ages, Bell lauded the entire Catholic League. “Having such a talented team that we have along with the great competition we face really makes the game of softball so much more enjoyable, especially (pitching against) tough batters,” said Bell. “It really makes that game more interesting. The Ragdolls celebrate their Catholic League-clinching victory. they now to the PIAA state softball playoffs. Bell said she and the Ragdolls (22-2 overall) are not satisfied quite yet. After beating String Theory in the District 12 championship, 12-0, four days later, the Ragdolls begin PIAA state tournament play next week. The hard-luck losing pitcher, sophomore Megan Burns, deserved better. Coming off victories over six-seed Conwell-Egan (2-1) and two-seed Bonner-Prendergast (15-4), Burns allowed only five hits and did not issue a walk. She also picked up her teammates after several fielding errors. Burns was unable to prevent the Ragdolls from scoring in the fifth inning. Ryan senior catcher Haley Burns reached first on an infield error and advanced to second on a one-out sacrifice bunt by junior Erin Woltemate. 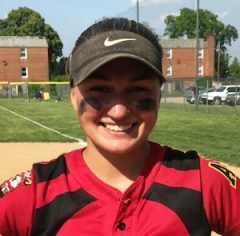 With two outs, senior star and Kutztown University-bound Kate Ostaszewski came to the plate and did what she does best when she lined a single that scored sophomore pinch runner Haley Cattallo for the first and only run. 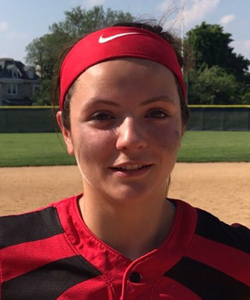 Ryan’s Kate Ostaszewski lined a two-out RBI single in the fifth inning for the winning and only run in the Catholic League title game over Lansdale Catholic. “I knew I had to step up and, being a leader, get a hit,” said Ostaszewski. 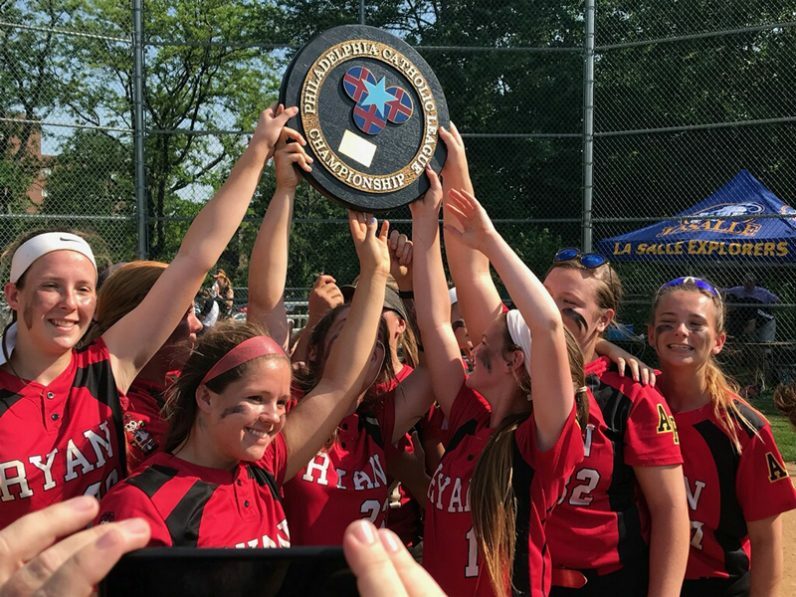 Six outs later, including the final one that everyone wanted to be a part of, Archbishop Ryan was the 2018 Catholic League champion.